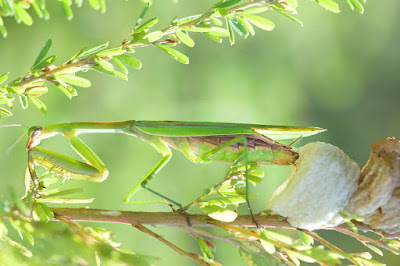 I have always wanted to find a praying mantis as she is laying her egg sack. Today I got lucky. I was watching a mating pair (for over an hour) hoping to see what would actually happen at the end. I was waiting so long, I started looking around and right behind me was a big fat lady praying mantis laying an egg sack!! If all goes well, there may be some 100 or more little baby praying mantises when they hatch next March or April.